And it’s actually an announcement as well, this post, as my 2nd Philipilihp custom is on it’s way from the other side of the Atlantic. And yes: Another Porsche it is. With a similar profile but another car, from another era. 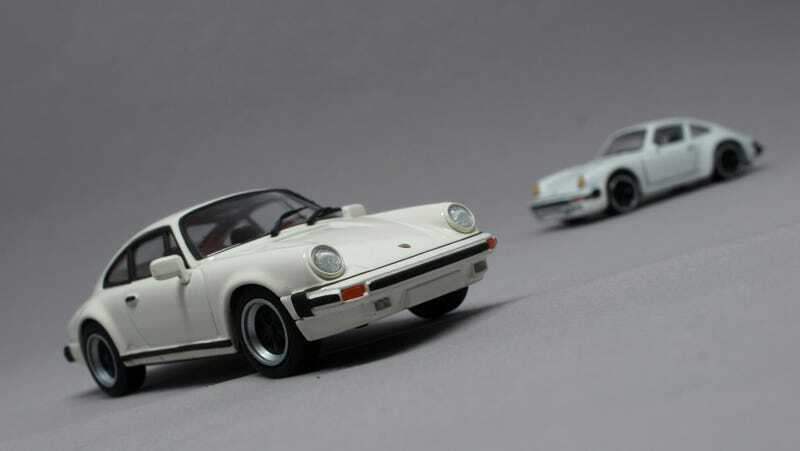 As I said, this 1/43 is a bit of an old Minichamps. So it doesn’t house in a black box but in the silver/blue one. And it has a base without scripting whatsoever. Not even sure if it’s limited to about thousand pieces like the usual MC’s. But it definitely is the only 1/43 I’ve had in my hands that comes this near to my 1:1. The form of the mirrors is correct, they’re just slightly too big. And the engine lid seems to have a kink just over the rear reflector. Otherwise: Pretty neat. No spinning wheels though. Und das war es wieder. This really is one of my favorite casts, for obvious reasons, and it probably never will go. Just like that 1:1.